Waimea is built on the northern side of the Big Island. It lies on the slopes of the Kohala volcano in the saddle between this volcano and the famous MaunaKea (more information on Waimea). It lies on the boundary between the lush and rainy Hamakua coast and the dry and sunny north Kona resort coast. Because of these reasons the Waimea weather is difficult to predict. Waimea is located 2676 feet (815 m) above sea level and this also influences the weather. Temperatures here are generally cooler compared to the rest of the island, and especially the many clear nights can feel crisp. 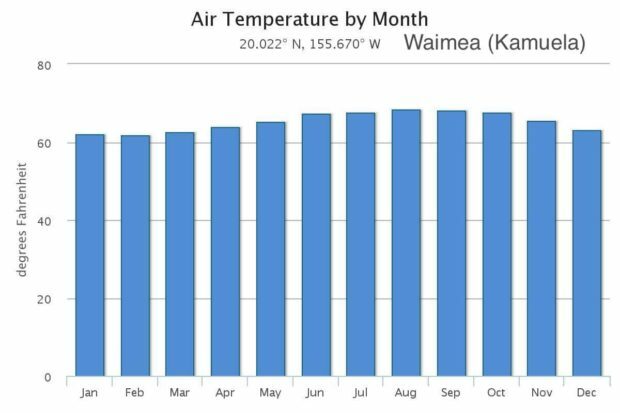 You can see this in more detail below, where we present you the yearly averages at Waimea for the temperature, the precipitation and the number of cloudy days. If you are interested in the general weather trends for Hawaii you should read “Big Island weather, explained!“. Average temperatures in Waimea range between 61 and 68°F (16 and 20°c). 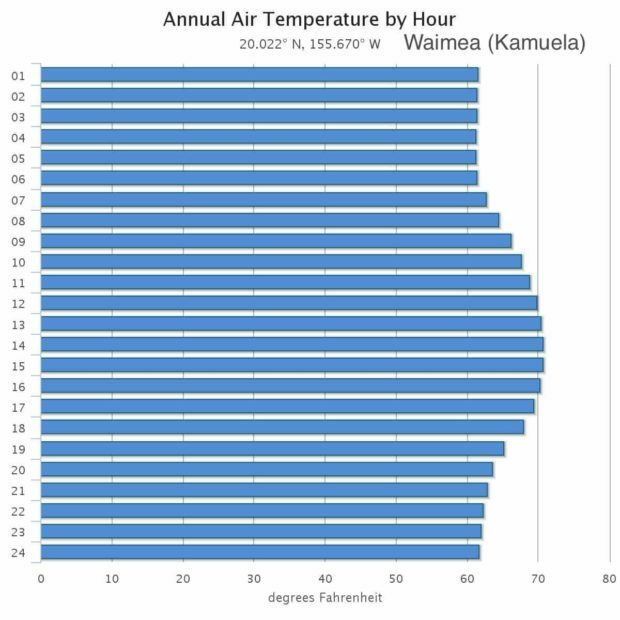 These temperatures are lower than those at most other destinations on the Big Island, which can easily be explained by its altitude: Waimea was built almost 2700 feet above sea level. July, August, and September are the warmest months, while February is the coolest. 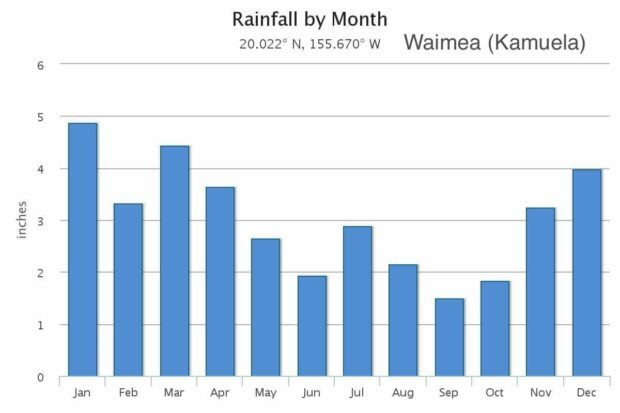 The amount of rainfall in Waimea is most comparable to, but a bit higher than, the rain in downtown Kona. 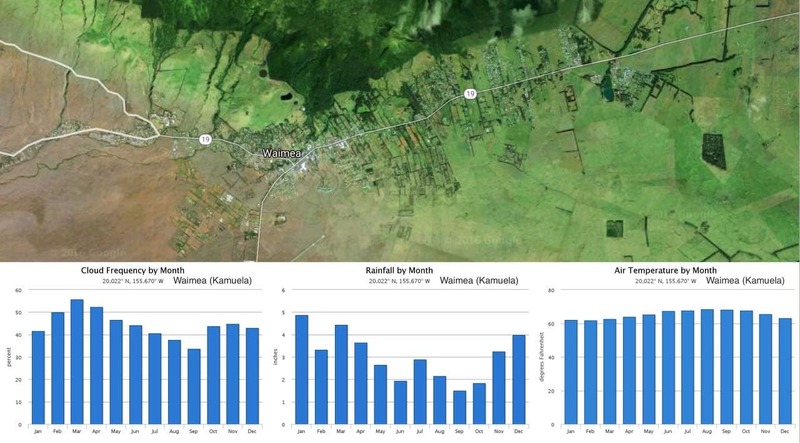 Waimea receives between 1.5 and 5 inches of rain per month, and a yearly total of 37 inches. 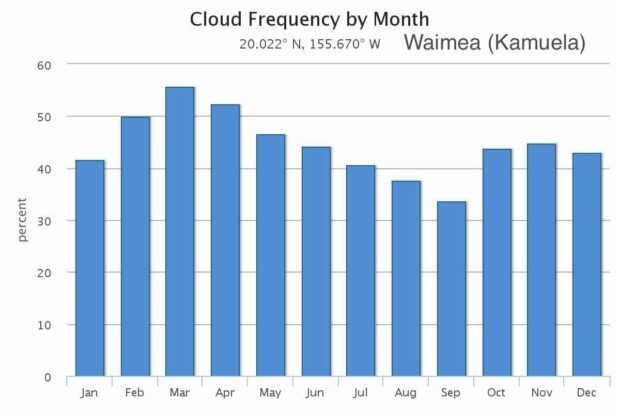 The average monthly cloud cover in Waimea is quite low. This is mostly due to the exceptionally clear nights. During daytime, clouds are unfortunately a common sight. There are large differences in cloud cover throughout the day. You will have the most chance to see the sun around sunrise and sunset while during the day the chance of clouds increases rapidly, peaking above 70% between 2 pm and 4 pm. 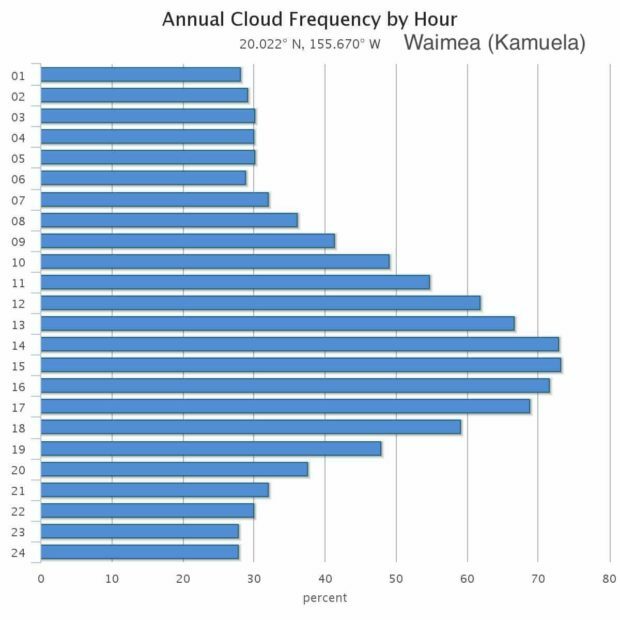 The average cloud cover in Waimea is quite low: almost as low as that on the north Kona resort coast. However, this is mostly because of the exceptionally clear nights. The hourly average amount of cloud cover (left image), and temperature (right image) for Waimea on the Big Island of Hawaii. See the “Sources” section below for image credits. The yearly average temperatures vary between the low 60’s during nighttime and the low 70’s in the afternoon. A light coat or a sweater is thus a good thing to bring during the early morning and early evening. If you are interested in the current weather conditions and weather forecast for Waimea, please look up the NAOO forecast. On average, Waimea is cooler, drier, and has fewer clouds than most popular destinations on the Big Island. Especially the nights here are often clear making this a very good place to go stargazing!